Monica is a CIA agent and Kord is an FBI agent. They are thrown into a protection detail when an assassination attempt on a visiting Saudi prince occurs. Relations are strained between the US and Saudi's and the Prince has a twofold purpose for his visit. His mother has been diagnosed with cancer and is visiting MD Anderson and the Prince is looking into leasing some oil fields to the US. If the Prince was killed on US soil the tenuous relationship would be severed. Monica has experience in the protocol of behavior for women with Saudi men. And Kord is a friend to the Prince and insists on being part of the detail to protect him. Neither Kord nor Monica are happy with the situation at first, but as time goes on they manage to forge a shared respect for each others abilities. High Treason was filled with excitement as well as quite interesting relationships between the characters. I love that Monica didn't try to change years of tradition by being an overbearing female. She gained respect from the Prince and his entourage through her behavior and ability. I also loved the peek into the life of a Saudi leader. It was interesting to the story as well as an interesting look into that culture. Monica had trust issues and through the story had to work through those. This led to a couple of good spiritual discussions between Kord and Monica as well as Monica and the Prince. I liked that the characters were able to have healthy dialogue without spewing hate. Monica was a very strong female lead and I really enjoyed that. She was strong and determined and ready to run into danger to protect. I liked how Monica and Kord's relationship grew and how they were able to establish a mutual respect for each other. The suspense was timely placed and kept the story moving along at a fast clip. 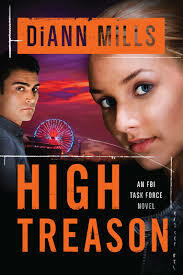 If you are a fan of romantic suspense then I highly recommend this FBI Task Force series, you won't be disappointed!